This event is the first of many Velocity Start events which will provide students with a package of workshops to help them understand the fundamentals of starting a business. In its preliminary stage, the focus is on identifying a problem and brainstorming a solution. From there, the workshops will slowly help students turn their business ideas into a potential company. The guest speaker for the night, Wes Worsfold, is a Waterloo alumnus who currently works as a Velocity Start coach at the Velocity Garage in downtown Kitchener. He has consulted hundreds of companies and has many years of experience in the tech industry. Worsfold also runs his own startup called BitBakery Software, which helps customers take their idea from concept to implementation, providing services for planning, design, and development of software. The main objective of the workshop was to make the process of creating a startup easier. 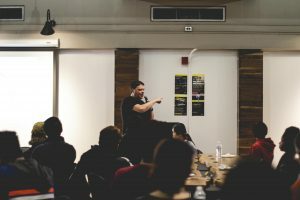 After finding an idea for a business and a problem it solves, Worsfold highlighted the importance of finding a target market for the product or service. 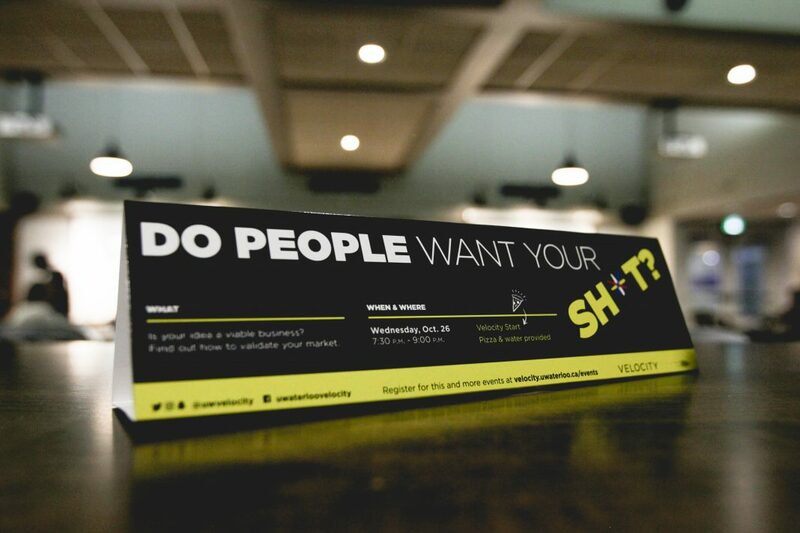 “UWaterloo students are very good at thinking of new ideas and building [on]them, but some fail to find a group of people who will be interested in purchasing the product,” Worsfold said. After finding a target market, it is important to start a conversation with some of these potential customers and track the collected data to conduct analysis. The lack of communication between startups and potential customers is what prevents businesses from developing a product that would fulfill a need in the market. However, according to Wolsford, even if customer information is gathered, the data might be unreliable. Worsfold talked about a concept called the Mom Test, where a person pretends to pitch their business idea to their mom, and bases their business decisions on the response they receive. Even if your mom doesn’t like your business idea, she’ll try to be understanding and encourage you to continue pursuing your dreams. This leads to a misassumption that the product/service is something people actually want, which causes mayhem later. The key to gathering useful information is to ask the right questions. Try not to disclose what you’re selling and ask open-ended questions to encourage customers to express their opinion about different factors relating to the product or service. For example, rather than asking “I’m selling a digital cookbook, would you be interested in buying it?” asking questions like “How many hours do you read on your iPad?” or “What do you look for in a cookbook?” will provide more relevant information about your customers. An important point Worsfold gave was a good case discovery should not tell customers what they want, but rather have them tell you what they want. Another topic that was discussed was how to connect with individuals, either as a potential customer or mentor. Several ways are through channels, organizations, and personal network. LinkedIn is a powerful resource for finding other professional people. If you don’t have a mutual connection that could introduce you, it is possible to connect with them with cold calls or emails. It is crucial for a startup to start making connections early on because if they can find someone experienced in the field who is interested in their company, it will open up many opportunities for them such as receiving advice and feedback about their company as well as possible financing. Even if some of the customers you reach are not interested in your product/service, they can be asked to refer you to connections who might be. In doing this, you will be able to make more connections through your network. One final piece of advice was given to aspiring entrepreneurs: attend entrepreneurial events and talk to people. You will learn from networking with others and discover if your business idea is a viable one.